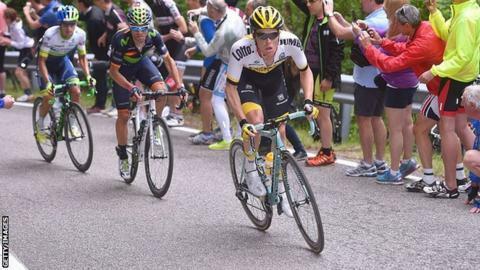 Lotto's Steven Kruijswijk has moved into the Giro d'Italia overall lead following stage 14 on Saturday. The 28-year-old Dutch rider finished second behind stage winner Esteban Chaves, 26, to open a 41-second lead over Astana's Vincenzo Nibali. Colombian Chaves caught compatriot Darwin Atapuma to win on the line. Movistar's Andrey Amador, the first Costa Rican to wear a Grand Tour leaders' jersey, led heading into the race from Alpago to Corvara. Amador, who dispossessed Luxembourg's Bob Jungels after a first day in the mountains on Friday, and his team leader Alejandro Valverde finished nearly four minutes behind Orica rider Chaves. Italian favourite Nibali, the 2013 champion, crossed 37 seconds behind to build a significant advantage on Valverde. The Spanish rider is expected to be one of his main rivals for overall victory in the three-week race which concludes in Turin on 29 May. Sunday's stage 15 time trial is a 10.8km route from Castelrotto to Alpe di Siusi.